DIVA has some built-in application utilities which are accessed from the Utilities Screen, shown below. The Close button is fairly self-explanatory so it doesn’t need much detail: click it and the screen closes and returns you to the DIVA Main Screen. 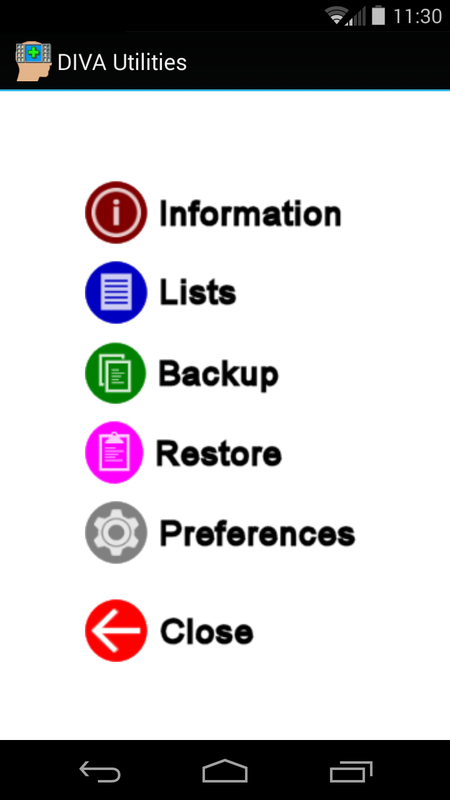 When you click on the INFORMATION button, you are presented with a message box that tells you the number of Goals and Affirmations you have, how many files and their sizes you have in the DIVA system, and how many and that size of the files in the backup folder, if you’ve backed up your data. You can see the results in the popup message that appears, similar to the one on the left. The count of Goals and Affirmations is always at the to, followed by the current files which are followed by the backup information. If you have not created a backup yet, you will be notified of that in the bottom section of the message. If you have set the Show Goals on Start-up or Show Affirmations on Start-Up options in the General Settings tab of Settings, when the DIVA starts, it will show you those Goals and Affirm ations as a display. The LISTS button displays the same show, either lists or slides, depending upon your settings. While the list is triggered automatically, based on your settings, this is the place where you can view that display at any time. It’s a good idea, from time to time, to make a backup copy of your data. This can be useful if you delete a bunch of Goals or Affirmations and want to restore them. When you do a backup, it erases the previous backup and replaces it with the current data. It not only backs up your data, but the pictures saved with the program. This is a very rapid operation and you will only see a brief pop-up message when it’s complete. 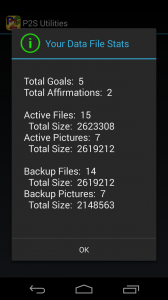 If you accidentally delete a bunch of Goals or Affirmations, or have deleted pictures from Goal files, you can restore them from the backup you made previously. Please Note: This is NOT a selective restoration. 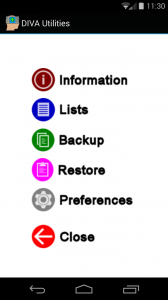 When you click on the restore button, the entire backup is restored to the active directory, overwriting anything that’s there. After clicking this button, you will be warned and asked if the restore is really what you want to do. If you answer yes, it’ll ask you one more time, just to be sure before overwriting your existing, current files. Just as on the Main Screen, you can access the DIVA settings system from this button, which will load the Settings Screen.